Do not let the start of the book betray the breadth and depth of the topics about us, humans, this book covers. And in great depth too. 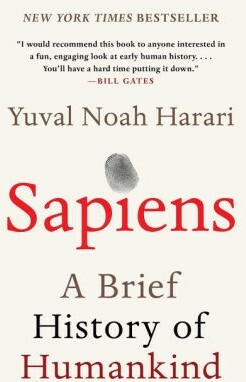 A good friend of mine gave up after reading the first few pages since he “wasn’t interested in evolutionary biology”! And you persist and are rewarded with a compendium of a book that covers all aspects of being human, from the various ‘fictional’ setup we have in the society, including the concepts of organizations and nations, the roles attributed to the genders, patriarchy and matriarchy, and what not! The book ends with the dominance we have achieved as a species over all the others on earth, and the destruction, often irreversible, this is causing on the only place we can call home. It is amazing an author can write, for a non-academic layman, such detailed and easy-to-read book on anthropology! Make no mistake, the book is long, and the material is dense and heavy. But do not let that scare you…push through it and you will be proud to have challenged yourself to learn about ourselves. This book will change and challenge the way you see the world, the way you perceive this society of humans, we live in, their interactions, and should be a required reading, in some form, for folks who have people management roles, and human resources folks. I would not hesitate to put this book in the league of ‘A brief history of time’ by Stephen Hawking and ‘A short history of nearly everything’, by Bill Bryson. A book worth reading slowly, assimilating, mulling over…and re-reading given a chance! There’s so much to gain!